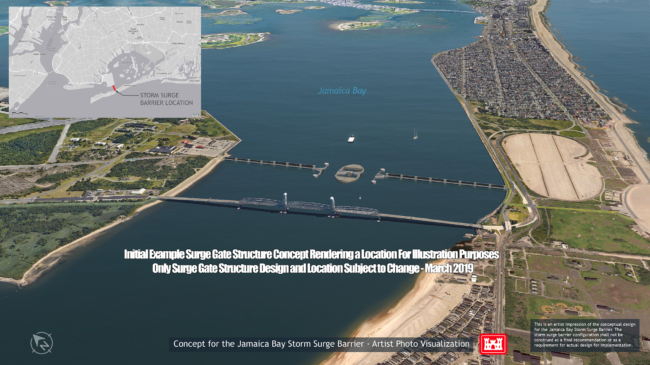 Blogs > Ecology > Army Corps ‘Interim Report’ on storm surge barriers: What have we learned? The Hudson River, its living creatures, and the wider environment are simply not being considered at this vital stage in the U.S. Army Corps of Engineers’ study on storm flood protection. We need to prepare for both storms and sea level rise, without harming the environment even further. Learn more and take action. With the release of 1,600 pages of information, the U.S. Army Corps of Engineers has provided a window into its ongoing study of options to protect New York against flooding from coastal storms – including storm surge barriers that could devastate the Hudson River ecosystem. We’ve seen preliminary cost estimates for the six options up for discussion. We know more about how the Corps is calculating the benefits for each one. Unfortunately, and most importantly, we’ve gained a better understanding of just how limited the Corps’ approach is – and how fundamentally flawed. As we’ve said before, the Corps is not attempting to solve the inevitable and increasingly serious problem of sea level rise flooding in New York City or anywhere else. Also, the river, its living creatures, and the wider environment are simply not being considered at this vital stage, when six options are still on the table. The study is narrow, bureaucratic, theoretical and myopic, while the issue before us is more far-reaching and high stakes than anything imaginable. We need a better approach. We need to prepare for storms and sea level rise, without harming the environment even further. Here’s what we’ve learned from the Interim Report in the New York – New Jersey Harbor and Tributaries (NYNJHAT) Coastal Storm Risk Management Feasibility Study. Please stay tuned for actions you can take to help us demand better for our communities and rivers. • The Army Corps’ approach continues to ignore the profound and permanent consequences that storm surge barriers across New York Harbor could have on the environment. During a public comment period last year on the scope of the study, the No. 1 concern – included in more than 91 percent of 4,250 comments received – was the impact on the environment. 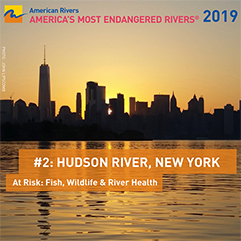 As Riverkeeper and many others have expressed, some of the options being considered could have devastating effects for the Hudson, the Harbor and connecting waterways. 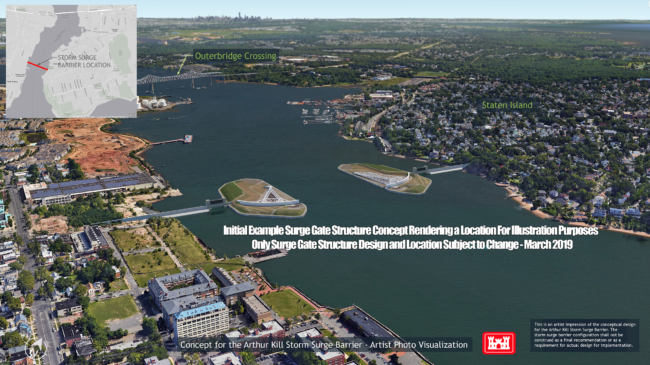 One scenario would build the world’s largest storm surge barrier from Breezy Point, Queens, to Sandy Hook, N.J., and a second barrier across the west end of Long Island Sound. The Corps estimates the cost of this option at $119 billion. 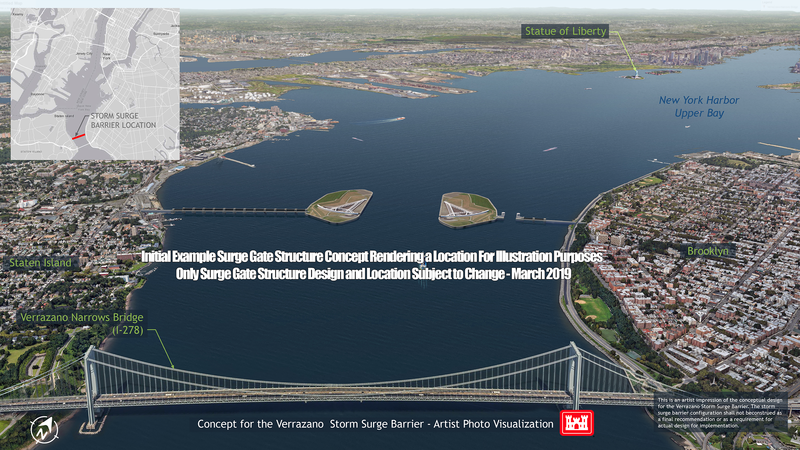 Another would put a barrier across the Verrazano Narrows (see simulation, above), and tidal gates throughout New York Harbor ($47 billion). Just one alternative leaves the waterways to flow free; it calls only for land-based floodwalls, dunes and levees ($15 billion). In-water storm surge barriers threaten to disrupt the migrations of fish, including endangered species, and restrict the free movement of marine mammals. They could dramatically alter the tidal ebb and flow in the Hudson, essential to the health of the river and the creatures that rely on it as a spawning ground and nursery. Tides are essential to transport sediment, nutrients and contaminants. They nourish and sustain wetlands. The river evolved to have this exchange with the sea. Disrupting that exchange could be the end of the river as we know it. These and many other potential environmental harms must be studied and understood before the Corps’ decision – scheduled for early 2020 – on a “tentatively selected” plan or plans. As it stands, riverwide environmental impacts have not been examined, and it is unclear whether they will be before that decision is made. Further, no “site specific” details will be examined before then – only broad concepts. The Corps’ cost estimates do factor in “environmental mitigation” costs, but those are limited only to the immediate footprint of whatever is built on the land and in the water. The analysis flat-out ignores the damage that storm surge barriers would cause to the rest of the river and the river’s life. Similarly, the benefits model that the Corps relies on doesn’t consider the environment at all. It’s as if the river, the marshes, the migratory fish, the endangered sturgeon, and countless other fragile features, have no value worth considering. We’re told that eventually, any plan will have to be “environmentally acceptable.” But it’s not clear what acceptable means. Acceptable to whom? Any potential damage to the river must be studied for each of the alternatives now, before the Corps moves forward with a tentatively accepted plan. The Interim Report finds the biggest net benefit in projects that involve numerous storm surge barriers throughout New York Harbor. That’s because the deck is stacked. The environmental mitigation estimates ignore river-wide environmental impacts and and the benefits model ignores the environment altogether. • The Corps is still trying to solve only half the problem. The study is fundamentally about how to protect against flooding from storms – and not the tidal flooding that will eventually, inevitably occur every day (even on calm, sunny days) with sea level rise. During the comment period in 2018, the second biggest concern voiced by the public – 84 percent – said they wanted the Corps to address sea level rise flooding, not just storm surge flooding. More recently, on February 28, 2019, the New York City Council adopted a resolution calling on the Corps to do just that. Storm surge barriers, with gates left open for shipping except during storms, would do nothing to protect communities against eventual flooding from sea level rise. Further study is needed to understand those risks and identify integrated solutions. While the Corps acknowledges that more study is be needed to manage sea level rise flooding, it makes no commitment to actually do such a study. The city just announced that by 2100, with over 6 feet of projected sea level rise (the upper estimate), 20 percent of Lower Manhattan’s streets will be exposed to daily tidal inundation, submerging portions of Lower Manhattan’s edge in up to 3 feet of water on a regular basis. We need a comprehensive study so that any potential projects are designed, evaluated and modified based on their ability to address everyday flooding from sea level rise, as well as intense storms, far into the future. With that sort of approach, storm surge barriers and tidal gates would fall out of consideration. They do nothing to protect against sea level rise flooding. Land-based walls, dunes and levees, which can protect against both storms and sea level rise, would have the advantage. Unless the Corps can fully incorporate sea level rise into the study, it will remain fatally flawed. • Importantly, shoreline measures are deemed cost-effective in protecting against storm surge, under the Corps’ preliminary analysis. The only acceptable scenario presented in the study thus far – Alternative 5 – involves on-shore measures, which could protect against both storm surge and sea level rise flooding without harming the Hudson, the Harbor or its connected waterways. The Corps needs to take Alternative 5 seriously, and expand on it – not downgrade it artificially based on a formula that is divorced from reality. • The selection of a front-runner plan should be well informed by hard data and scientific studies. It’s unclear how that could possibly happen by Spring 2020. The Corps admits that the Interim Report presents only a “partial” analysis, lacking in many ways. 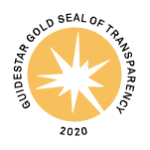 It also admits that, as of now, it does not have enough information to make a recommendation on a tentatively selected plan. The report skips any attempt to consider the actual geology of the locations where structures would be built. It provides no actual plans or designs. We’re given regional maps and a few theoretical renderings. How can you possibly select among mere concepts, based on a narrow assessment of costs and benefits, when the Hudson’s vitality and the region’s economy are at stake? Here’s all we really have: A preliminary analysis, based on limited, theoretical frameworks, using enormous assumptions, and subject to multiple disclaimers. • Sea level rise projections for New York City are higher than what the Corps is using in its study. Estimates from the New York City Panel on Climate Change put middle range projections at 1.83 – 4.17 feet of additional sea level through 2100, at the Battery in Manhattan. The high estimate is 6.25 feet of additional sea level by the end of the century. Under a new “Antarctic Rapid Ice Melt Scenario” which includes the possibility of Antarctic ice sheet destabilization later this century under continued warming at high greenhouse gas emissions rates, NYC could experience 6.75 feet of sea level rise in the 2080s, and 9.5 feet by 2100. • Public involvement can make a difference. It already has. The Corps has taken note of the comments it has received from the public. It has allowed for more time and more public discussion than originally planned. Where the Corps continues to skip over issues of environmental impacts and sea level rise, the public won’t. We will continue speaking out for a more comprehensive, science-based approach, one that does value the environment, the Hudson River, the communities along the shoreline that face flooding, loss of marsh and sediment, etc., as sea level continues to rise.